Today was one of those kind of days where I was having trouble coming up with something to make for dinner. I was kind of in a recipe rut. I wanted to make something different but hadn't gone grocery shopping yet for the week. 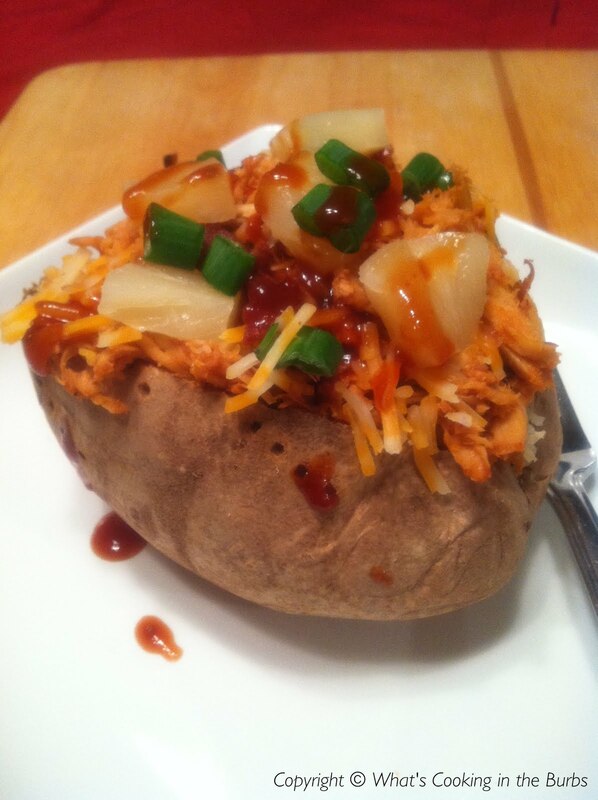 After scouring my pantry I decided to create a potato stuffed with Hawaiian BBQ chicken. Kind of different and that is what I liked about them. The sweet, spicy, and salty combo was fabulous! When the potatoes are cool enough to handle, slice each one down the center, leaving the ends in tact. Gently push on the ends of each potato to open it and expose the center. Divide the chicken mixture between the potatoes, then add a few pineapple pieces and 1/4 cup of shredded cheese along with half of the bacon. Drizzle with additonal sauce and garnish with chopped onion if desired. Enjoy! wow, this looks so good. Thanks for sharing this recipe.